If you’ve ever stepped into the batting cage at your local amusement park, you know how difficult it is to hit a baseball. As Ted Williams once said, “Making good contact with a round ball and round bat even if you know what’s coming is hard to do. That seems to be the one major thing that all young players have difficulty with. Why? It’s the hardest thing to do in sports. 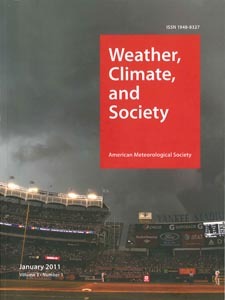 ” That being the case (and who are we to argue with the man whom many consider to be the greatest hitter who ever lived), baseball players at all levels would be wise to check out the study published in the latest issue of Weather, Climate, and Society that analyzes the influence of weather conditions on the performance of Major Leaguers. Wes Kent and Scott Sheridan of Kent State University examined statistics from more than 35,000 Major League games played in 21 different stadiums between 1987 and 2002, as well as NCDC cloud-cover data taken from the closest NWS office to the ballparks for all of the day games during the studied period. They found that hitters performed better on cloudy days, while pitchers’ statistics improved when the sun was shining. For hitters, this trend was most noticeable in batting averages, which when comparing clear-sky and cloudy-sky conditions improved from .259 to .266 for home teams and from .251 to .256 for road teams. For pitchers, strikeouts were the most salient statistic, increasing by almost half a strikeout per game on days with clear skies. The study also looked at a number of other statistics, including home runs, earned run average, errors, and winning percentage, with the results showing varying levels of weather influence. Additionally, the research made some interesting findings related to ballparks, with certain stadiums reflecting much more consistent trends than others, perhaps at least partially due to their architectural design. One of the most crucial aspects to the pitcher-batter interaction is how well the batter can see the pitch. Changing cloud cover presents different playing conditions, with some playing conditions potentially helping a batter see a pitch, whereas others may make reading a pitch more difficult. For example, brighter conditions may result in increased eye strain for a batter and a higher level of glare in a ballpark. These factors could contribute to less than favorable conditions for a batter trying to focus on a pitch, impacting performance in a number of areas. After all, according to Williams, you can’t understand hitting without understanding the science: “If there is such a thing as a science in sport, hitting a baseball is it. As with any science, there are fundamentals, certain tenets of hitting every good batter or batting coach could tell you.” If he were still alive and hitting, we bet Williams would use this new research to his advantage at the plate.